With California alone producing 89 percent of American wine and Washington and Oregon running 2nd and 3rd in production by state, it’s no wonder that the wine most of us drink on a regular basis comes from the west coast. But shouldn’t we, at least every once in awhile, try wine from states like Michigan, New York, New Mexico, or North Carolina? Yes, I know, there’s still a lot of plonk being made in some of these places, and I am certainly not proposing that we ditch our long nurtured allegiance to the wines of the west. 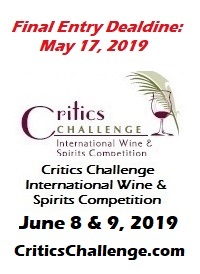 All I’m saying is that sampling some of the best wines from other parts of the country can be a new and exciting tasting experience, an opportunity to broaden our palates, and a chance to learn a little more about the history of wine in America. And here’s something else: once you get away from the major capitals of the wine world you’re more apt to meet the actual vintners themselves. These are people who are usually willing to share firsthand their stories of what it’s really like to own a winery. 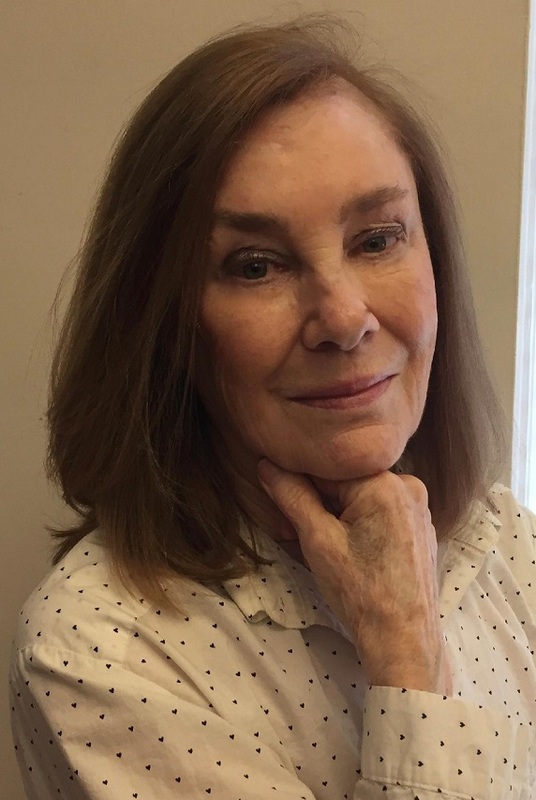 If you show an interest, they may reveal their hopes and expectations about winery ownership, as well as the challenges they faced along the way and their long-term future goals. Allegro Winery in Brogue, Pennsylvania, is just such a place. Pennsylvania was among the initial wine producing states in America. In 1683, William Penn, the founder of the future Commonwealth of Pennsylvania, planted grapevines from France and Spain in his vineyard along the Schuylkill River. These vinifera vines (which, unlike native varieties, had no resistance to certain American scourges such as Phylloxera) all died, but sometime around 1740 James Alexander, the gardener to William Penn’s son, Thomas, discovered a vine growing in the woods not far from the original Penn vineyard. Almost certainly an accidental cross between one of Penn’s original vines and a native grape, this first American hybrid was named the Alexander grape. It would be subsequently propagated and sold all across the eastern states. By the end of the 1760s winegrowing had become a fixation in Pennsylvania. The fact that rot, insects, weather and other afflictions ultimately devastated every European vine planted there seemed not to discourage the would-be grape growers, who kept at their Sisyphean task until the Revolutionary War ended most viticultural endeavors. 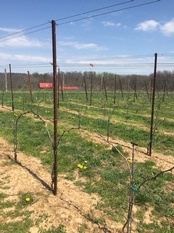 After the Revolution, the first notable attempt to establish a successful vineyard began near Philadelphia, where Penn had planted his vines a hundred years earlier. Pierre Legaux, a dynamic, if somewhat unsavory Frenchman, founded the Pennsylvania Vine Company here in 1787, and planted what became America’s first commercial vineyard. Unfortunately for both Legaux and for the immediate future of the American wine industry, his vinifera plants all died, although the few Alexander vines he’d included in the vineyard produced a good crop and reasonably palatable wine. Despite the ongoing viticultural challenges and his precipitous slide towards bankruptcy, Legaux continued to import doomed vines from Europe, but his dream of establishing a successful viticultural industry in America died a few years before his own death, in 1827. During most of the 19th century, winemaking in Pennsylvania lurched along here and there. Experiments with grafted vinifera were being conducted by the end of the century, but progress was slow as the temperance movement was gaining strength. And then, Prohibition put an end to further experimentation. Prohibition was repealed in 1933, but Pennsylvania was the last state in the nation to revoke the laws restricting commercial winemaking. Not until the passage of the Pennsylvania Limited Winery Act in 1968 were winegrowers finally allowed to make and sell wine. Five years later, brothers Tim and John Crouch, two classically trained musicians as well as wine lovers, bought a neglected 15-acre vineyard in Brogue. They established a small winery that they named Allegro, and by 1980 they were producing wines made from both vinifera and hybrid grapes. Their top wines were Bordeaux-style wines made mostly from Cabernet and Merlot. (I’ve tasted some of their wines, and most of the stuff was pretty good.) The genial brothers continued tending the vines, making wine and making music until Tim’s death in 2000. 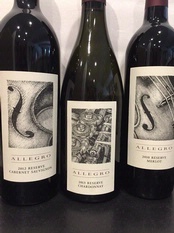 In the summer of 2001, Carl Helrich and his wife, Kris Miller, a young couple who had admired the Crouchs and had worked with them at Allegro over the years, signed an agreement with John to take over the winery on September 10, 2001. With that goal in mind, they played an active role in local wine trails for many years. They opened sales outlets in other locations. 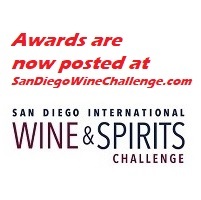 They hosted wine related events. 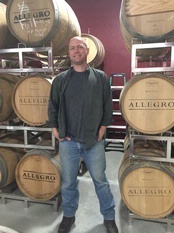 “We couldn’t afford to lose any sale, so we learned how to dial in certain styles of wine in order to increase sales--or at least not lose sales from the few people who would venture out to the middle of nowhere.” And so, diverging from the Crouch brothers’ single-minded devotion to dry wines, Allegro began producing a number of semi-dry and sweet wines. 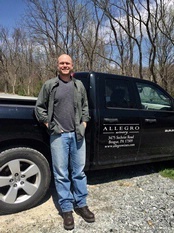 With the sale of sweet wines helping to keep Allegro afloat, more resources have been available to invest in the “mind-blowing wines” Carl Helrich believes in. And as every skilled vintner knows, excellent wine can only be made from excellent grapes. 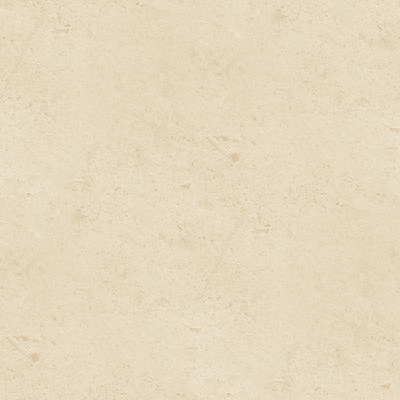 Allegro may be in the middle of nowhere but it sits on a site well suited to grape growing. It is the longest frost-free region in the state, and has well-drained clay and schist soils. Carl explains that early German settlers found farming difficult here on the west side of the Susquehanna River, but what they didn’t know was that this would be a great place to plant grapes. I am standing with Carl at the top of a hill where he has recently put in a new Merlot vineyard. “This is not an ideal site for Riesling or Pinot Noir, which is why we’ve finally begun replanting those blocks over to Bordeaux varieties,” he explains. Like the Crouch brothers, he remains committed to making classy dry wines from European grapes. As we consumers become more willing to expand our vinous horizons and begin seeking out wines from “the middle of nowhere,” our wine-tasting lives will be richer and more interesting. We may also be helping to fulfill the early winemaking promise of states such as Pennsylvania.